Founded in 1920 and based in Honolulu, Hawaii, the Pacific Science Association (PSA) is a scholarly organization that seeks to advance science and technology in the Asia-Pacific. PSA facilitates interdisciplinary and international research and collaboration in the Asia-Pacific region, with a focus on key issues in order to engage science in the service of human needs. PSA facilitates science that focuses on key issues and problems in the region, in order to engage science in the service of human needs and improve both the environment and quality of life of the region’s peoples. Individual PSA Memberships are handled through the Pacific Science journal (PSJ) website. Individual memberships are USD $50, and include a year’s subscription to PSJ. All individuals who subscribe to PSJ (which is published and processed by the University of Hawaii Press) automatically receive PSA membership. PSA facilitates interdisciplinary and international research and collaboration in the Asia-Pacific region, with a focus on key issues and problems in the region, in order to engage science in the service of human needs and to improve both the quality of life of the region’s peoples and of the natural environment upon which all life depends. PSA serves as a catalyst for scientific and scholarly collaboration; develops scientific capacity within the region; fosters effective communication between scientists, policy makers and the public; actively involves the Pacific Island states in regional and international scientific activities; and promotes the “Science of the Pacific”. Through Congress and Inter-Congress meetings, and ongoing scientific Working Groups, PSA provides an interdisciplinary platform for scientists to discuss and review common concerns and priorities in the region. Through our scientific network, PSA links scientists from developed countries with those from developing countries, including the archipelagic and more remote states of the Pacific. PSA facilitates research initiatives on critical emerging issues for the region, such as biodiversity loss, climate change, infectious diseases, and the social implications of globalization, in which science can provide crucial information in a way that is required by both society and policymakers to make sound and informed decisions. PSA is a Scientific Associate of the International Council for Science (ICSU). Multi-symposia Pacific Science Congresses, held in a different location every four years. Somewhat smaller and more topically focused Inter-Congress meetings are also held in between each Congress. The 11th Pacific Science Inter-Congress was held in Tahiti in March 2009 and the 22nd Pacific Science Congress was in June 2011 in Kuala Lumpur, Malaysia. The next meeting will be the 12th Pacific Science Inter-Congress, in Suva, Fiji in July 2012. Pacific Science, the official journal of the PSA. 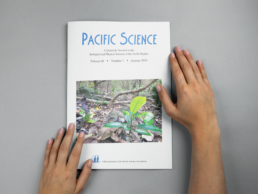 Pacific Science is a quarterly journal devoted to the biological, physical, and social sciences of the Pacific Region. The Pacific Science Association is composed of both national members (called Adhering Organizations), individual, and corporate/NGO members. Adhering Organizations are typically represented by the National Academies of Science from each country, but some national members are universities located within countries which are also national members. For example the University of the Ryukyus in Okinawa, Japan is a ‘national member’ although Japan itself is also a member. Individual and NGO/corporate memberships also form an important part of PSA’s constituency. The PSA structure consists of an Executive Board, Pacific Science Council, a Secretariat, and National Committees. The Pacific Science Council, which meets every two years at Congresses/Inter-Congresses, elects the PSA Executive Board. The Executive Board is the implementing body of PSA, and meets annually to set policy and oversees the general activities of the PSA. The PSA Secretariat is responsible for running the day-to-day affairs of the Association. The geographic scope covered by PSA is “the Pacific” – broadly defined – and thus including all countries and islands within and bordering the Pacific Ocean as well as countries with strong research interest in the region. This definition thus includes many Asian and American countries as well, but specifically in the respect that some part of their territories exists in the Pacific region. Conversely, “the Pacific Islands” is used to refer to the small island states in Melanesia, Micronesia, and Polynesia.